I still can’t believe that Summer is almost over. I mean, seriously. Did we even really have one? We must have had too much fun, although I’m going to try to hold on for dear life. I’m keeping the Summer vibes going with this ‘under the sea’ like tablescape. You need at least one last Summer inspired dinner party or just a dressed up dinner for you and your family, right? I often wonder what BJ thinks is up when I dress up the table for us on random Tuesday night lol. Who am I kidding? He knows me, he doesn’t think anything of it. 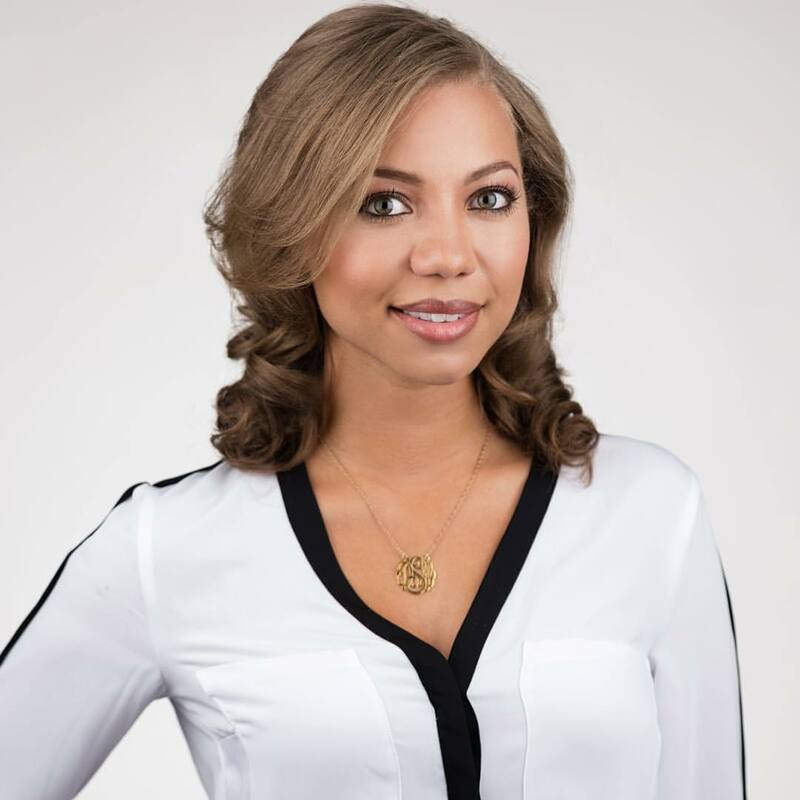 I love to switch things up and make an ordinary night look extraordinary. Plus, I never want him to say, ‘what do you have all this stuff for, if you aren’t going to use it?’. We don’t have to worry about that, I always do! 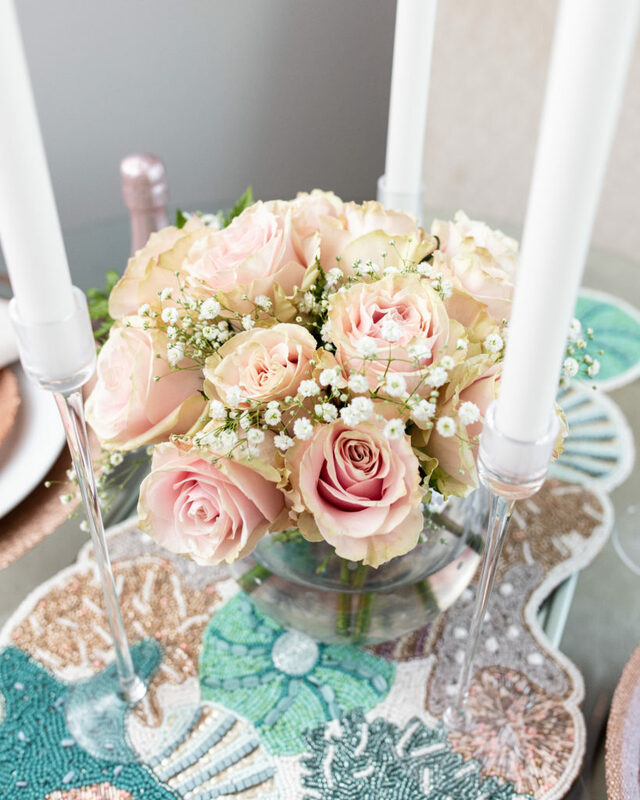 I like to think about a theme when setting a table – even if it’s just for the two of us. It helps me decide what accessories to break out and how I want to style the table. 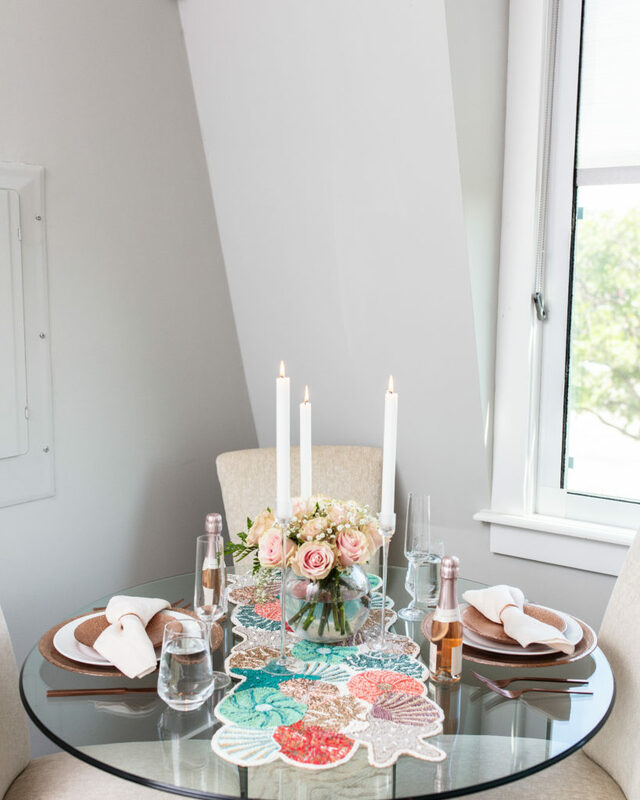 For this tablescape, the theme was based around this beautiful beaded runner I snagged (on sale) at Pier 1 (similar here). It’s Kim Seybert inspired (which you know I LOVE) and when I saw it, I knew exactly what dinnerware I wanted to use. 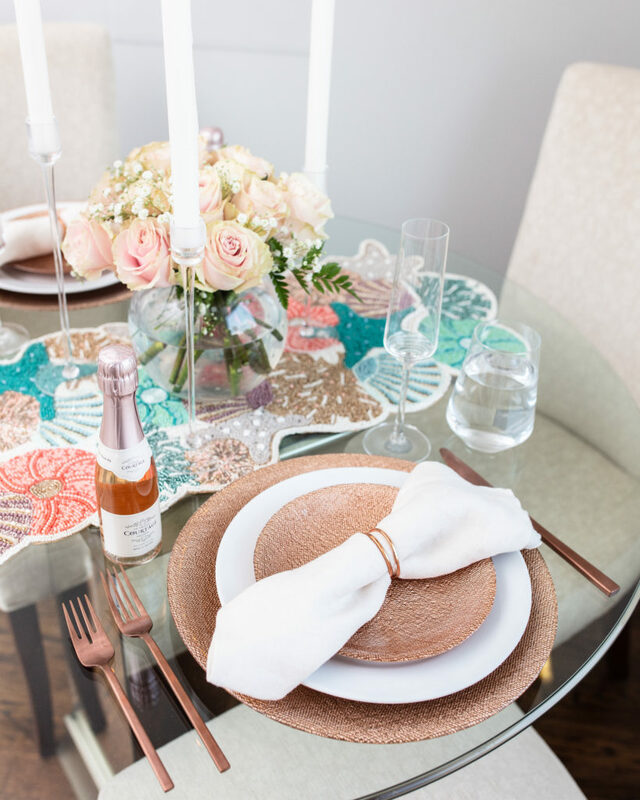 I broke out the shimmer rose gold glass chargers from Crate & Barrel (I also have them in silver…taking everything in me not to get the gold too) as the base. 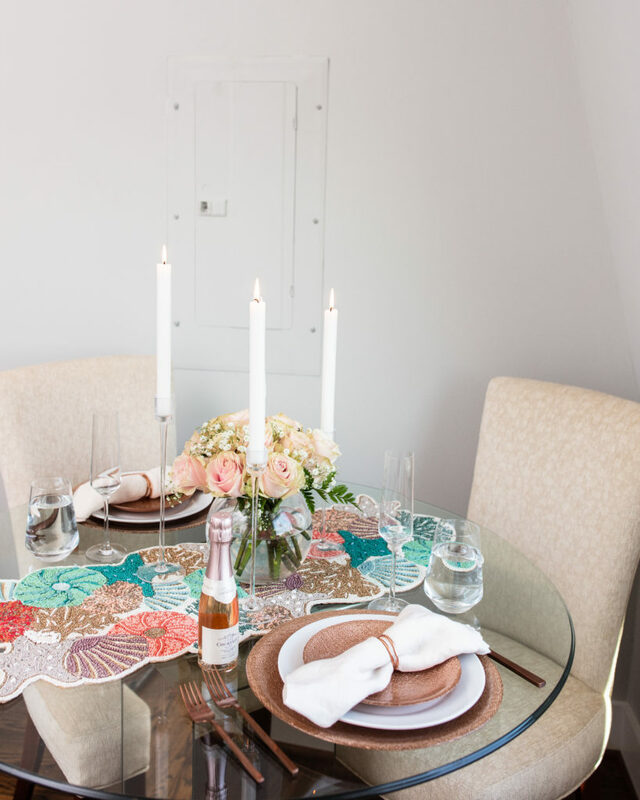 On top, I added my everyday classic white dinner plates and topped them with the shimmer rose gold glass salad plates. I love a layered look and it gives the setting some dimension. 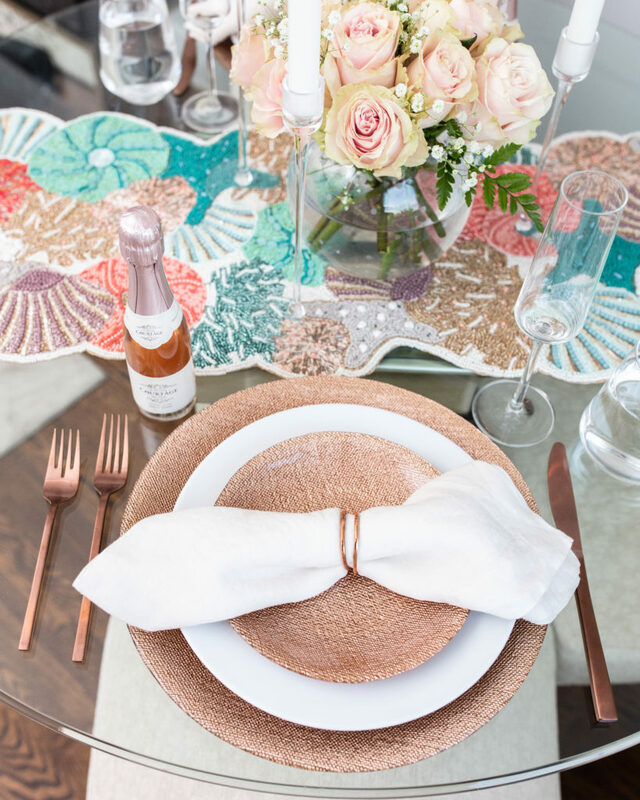 These linen napkins with copper napkin rings were perfect to top the dinnerware, as were my favorite rose gold flatware. I chose to go with pink/rose gold/copper pieces but you could do others too! 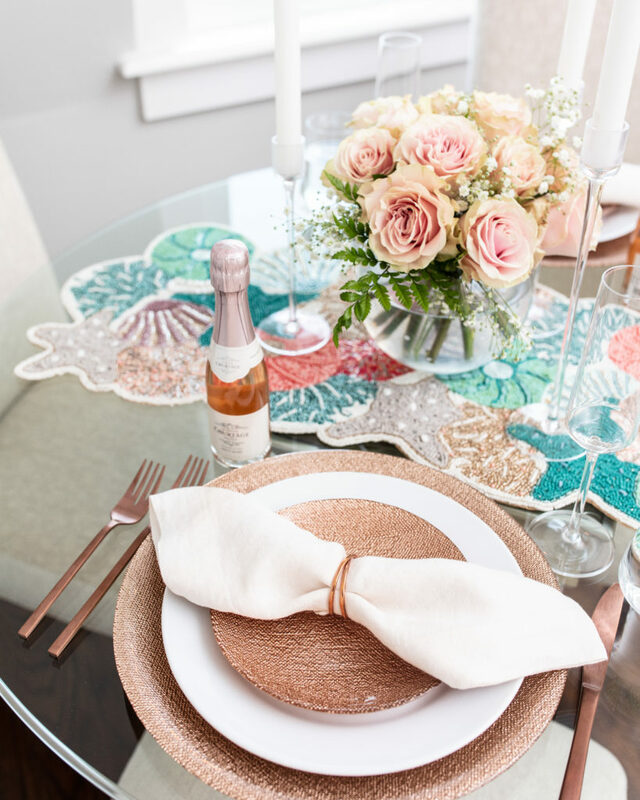 You could also do mixed metals with this look and use gold or silver flatware, especially with the pretty multi-colored beading in the table runner! The tour collection at Crate and Barrel is my GO-TO! You know this if you’ve been following me for a little bit. 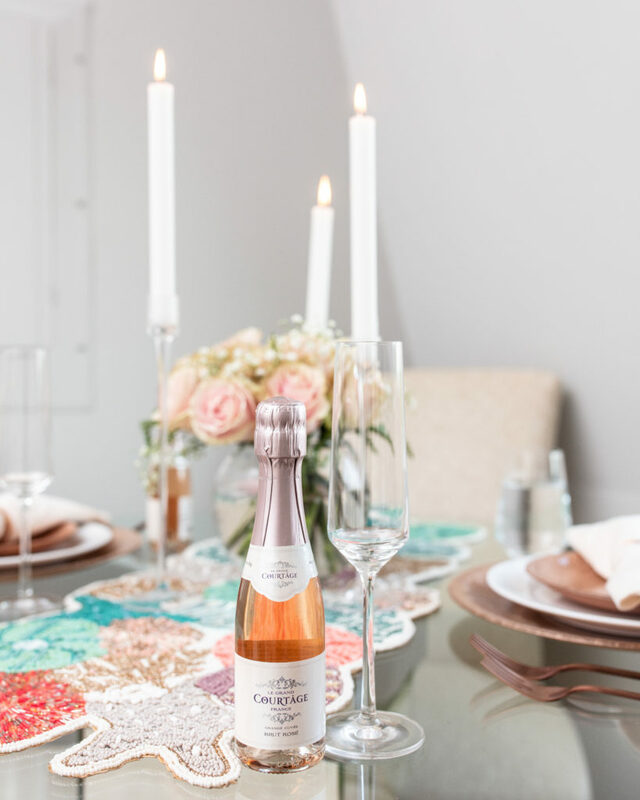 The glassware can be dressed up or down which means it’s totally worth it. Oh! They are very reasonable in price! I kept it super simple using a pretty pink arrangement to tie in the colors. Also, love candlelight so I used classic glass tapers to complete the look. Enjoy these last few days and use some of your fun pieces before we hit the Fall! Although, if you’re like me, you’ll use many of your pieces year round and just create fun ways to use them! !